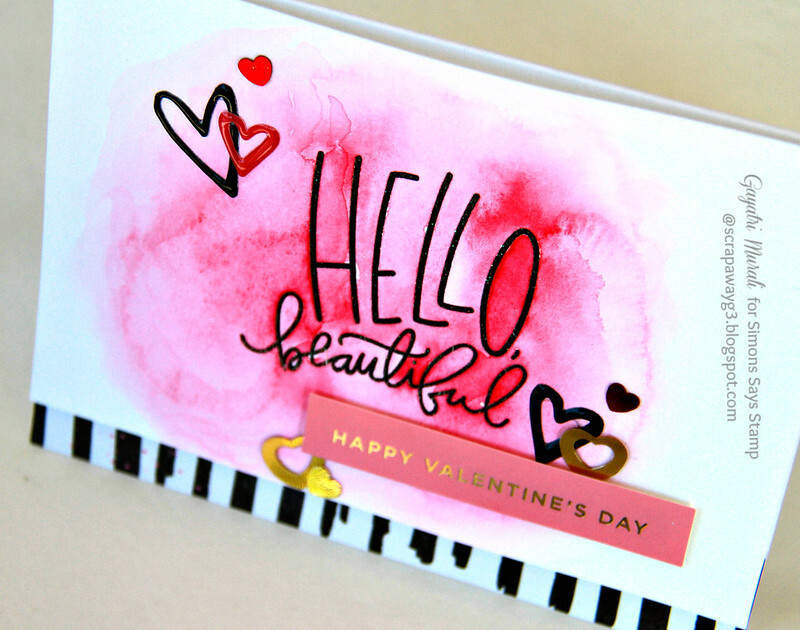 I am sharing my first card using the new February card kit from Simon Says Stamp. This kit is a very pretty Valentine themed kit. And as always the kit has fabulous pattern paper from Crate paper, coordinating sequins, epoxy stickers and a sentiment sticker sheet. This kit also has coordinated stamp set and dies from Simon Says Stamp which I love. And of course cardstock that colour coordinate with everything. I normally play with the pattern papers and the stickers to make quick cards. But with kits, I love the gorgeous big bold sentiment on the stamp set. And I did some watercolouring using resist technique. Here is my card. 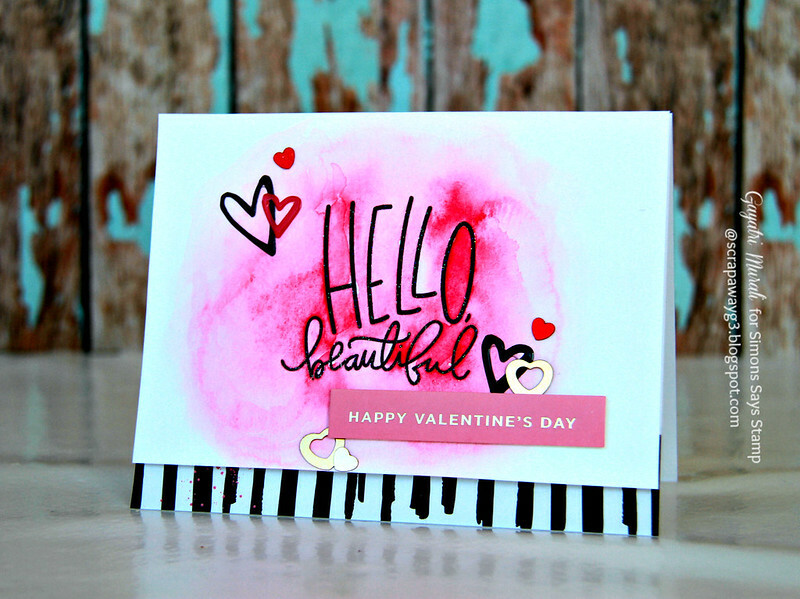 I started with black heat embossing the big “Hello Beautiful” sentiment on watercolour paper. Then used Gansai Tambi watercolour to add colour around the sentiment. I did wet on wet technique. I added clean water on the paper first, then added drops of colour and let the water do the work. Initially I gave a very light colour wash. Then when the paper is damp, I added more colour in certain areas to build depth and layers of colours. I also left the colours to air dry. So I literally watched the paint dry for sometime. Air dry gives awesome effect when colour mixes with water and seep through the fibres of the paper and dry.There are more areas of soft finish and some textured finish and some hard edge finish. The combination is beautiful. I trimmed the panel to five and half inches to three and three quarters. On the card base, I adhered a black paint striped pattern paper from the kit on the bottom of the card front. Then the watercolour panel using craft foam for dimension. To finish the watercolour front, I added a sticker from the sticker sheet in the kit and embellished with a few epoxy stickers and heart shaped sequins also from the kit. I LOVE the watercolour background around the heat embossed sentiment and gold accents. totally gorgeous Gayatri. Love the watercolour background. Great background! Love all the little elements.